Frankenstein presented by Theatre Works! I have the honor of being one of 10 artists displaying Artworks at theater works for the whole month of October! All the way from San Francisco, Salt Lake City & The North West Valley! 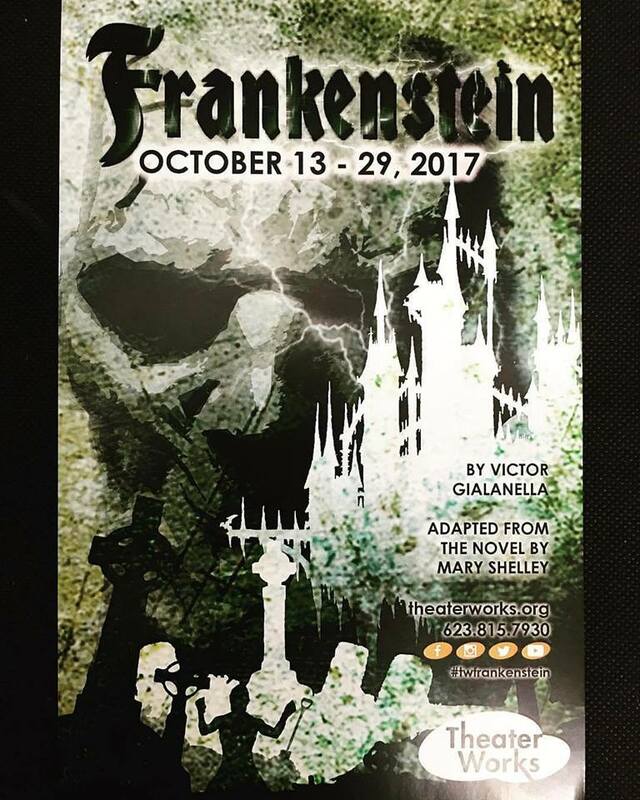 Frankenstein will be presented in the Gyder Theater at the Peoria Center for the Performing Arts: 10580 N. 83rd Drive, Peoria, AZ 85345. Performance dates are October 13 - 29. Show times are 7:30pm on Friday and Saturday nights (October 13, 14, 20, 21, 27 & 28), and Sundays at 2pm (October 15, 22, & 29), Saturdays at 3pm (October 21& 28), and one Wednesday matinee at 2pm on October 18th. Single tickets are $38; discounts available for seniors, students, and groups. To purchase tickets or find out more about Theater Works productions, contact the Box Office at (623) 815-7930 or visit www.theaterworks.org. Any unsold show paintings will be available for sale online after October 28th. Make sure to check out my Facebook shop page Art by Drew Tattoo or Etsy shop https://www.etsy.com/shop/ArtofDrewTattoo?ele=shop_open. Site updated and Shops open! Hey guys! Sorry the site has been in need of updating for a while, but I have new tattoo pieces and oil paintings uploaded! Keep checking back for more work to be added over the next couple days. I have also got my Etsy shop up and running so if there are any fine art pieces that catch your eye please click the link below to visit my Etsy shop! You can also purchase digital prints of my paintings, as well as a wide range of graphite pencil drawings at the shop so definitely something worth checking out! If you are looking for a custom tattoo piece or commissioned artwork please contact me by the email link or phone. Thanks for looking guys! I wanted all of my collectors out there to know that I have recently changed shops. I can now be found tattooin painting and hanging out at "Lighthouse Tattoo" on 59th Avenue and Utopia in Glendale AZ. So come by say what up and check out the new spot!